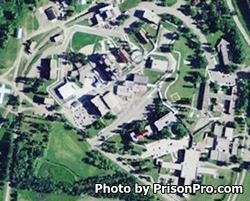 James River Correctional Center is a medium custody prison located in Jamestown North Dakota. The maximum capacity of this correctional center is 365 adult males. At one time this facility was coed, but in 2004 it became an all male institution. Inmates are provided a gym, library, music room and recreation yard. Educational opportunities at James River Correctional Center include adult basic education and GED classes. Inmates can also take classes in interviewing skills, resume writing, financial management, and college correspondence courses. Inmates at James River Correctional Center have their own caseworker, and have access to addiction counselors, psychologists, and medical services. Saturdays and Sundays are divided up according to the first letter of the inmate's last name. Inmates A-L have visits on Saturdays, inmates M-Z have Sunday visits. Visiting occurs in two session, a morning session for adults only from 8:30am-10:30am and a second session from 10:30am-3:30pm. Holidays are 8:30am-10:30am (adults only) and 10:30am-3:30pm.